Manufacturer of a wide range of products which include swift tri power stereo dissecting microscope and stereo dissecting microscopes. To meet the requirements of valuable clients, we are involved in offering Swift Tri Power Stereo Dissecting Microscope. 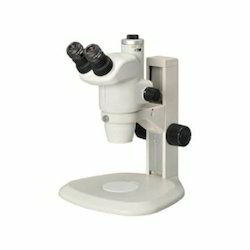 Our offered microscope is used for various field as it is manufactured with weatherproof and water resistance property. Furthermore, our clients can avail this camera in various models at reasonable rates from us. These products are checked on various quality parameters before final dispatching at our valued client end. 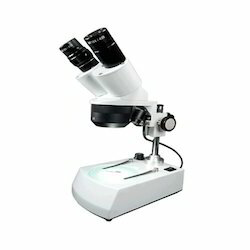 Our organization is renowned name in the industry, involved in offering an assorted collection of Stereo Dissecting Microscopes. Offered products are applicable in educational experiment, agricultural observation, medical research, science research and also for assembling and repairing in electronic industry. Highly skilled professionals use modern technology and high grade raw material in the manufacturing process of these products. Entire range is checked on predefined parameters of quality in order to offer perfect product at client's end. Observation Head:Binocular heads inclined at 40-deg, rotated through 360-deg with adjustable inter-pupillary distance. Focussing : By Rack and Pinion mechanism with adjustable tension collar. Magnification : Standard magnification 20x & 40x with flat field. Illumination : With integral illuminator, 2 lamps (LED / Halogen (either one) are fitted to provide both transmitted and incident illumintation. Objectives : 2 sets of objectives 2x and 4x, selected by rotating nosepiece through 90-degrees. Eyepieces : Standard extra wide field eyepieces WF-10x is provided.